Let’s say you’re currently ‘putting up with’ a compact 5’ x 8’ bathroom in a ranch or Cape Cod home. You know your floor-based vanity takes up a ton of room and looks bulky. 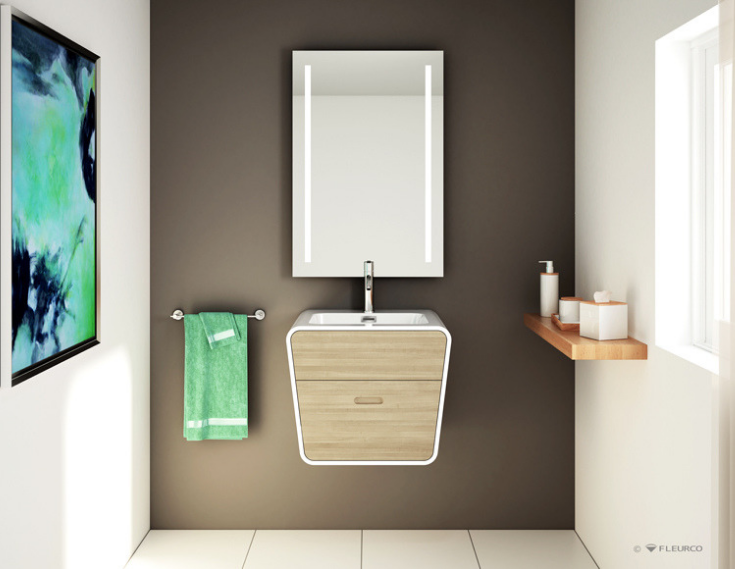 Since floating vanities are raised from the floor, you’ll be able to see light bouncing off the bathroom floor with this option. This sense of openness (and light transmission) gives the illusion of more space. It’s a ‘David Copperfield bathroom magic trick’ you need to try. (Advantage #2) – Shallow depth wall hung cabinets work for narrow bathrooms, or tiny and shipping container homes. If you feel the need to join Jenny Craig just to navigate through your narrow bathroom, that’s a bad sign. While it’s a nice luxury to have a 25” deep floor-based cabinet, sometimes these bad-boys flat-out take up too much room. You shouldn’t need Jenny Craig and a new diet to make your bathroom work (although, as my wife tells me, I could stand to eat a little less ice cream every night. However, I know she’s wrong because I’m just concentrating on getting the right amount of dairy in my diet). Instead of putting yourself on a diet (or eating less ice cream, which I’m morally opposed to), how about putting your vanity on a diet? 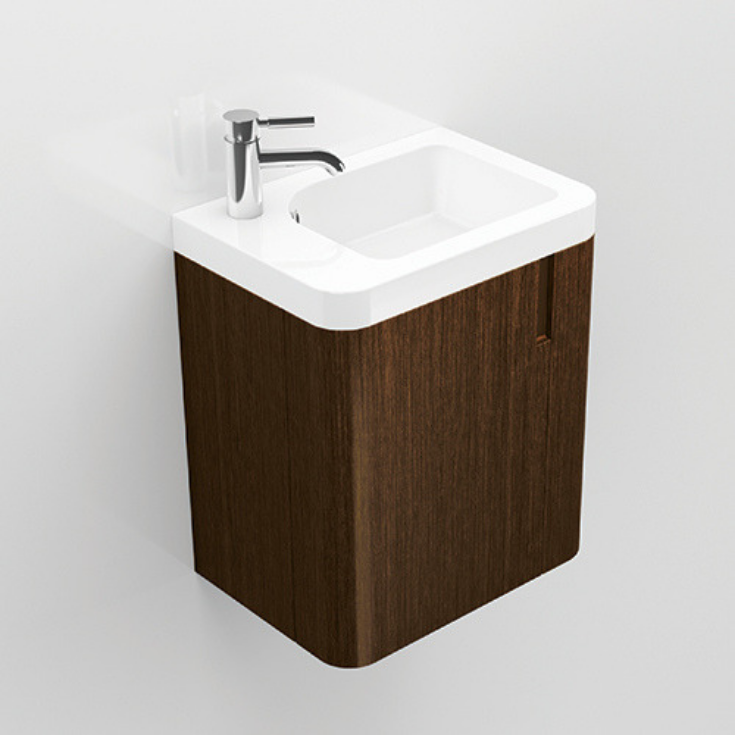 You can use these slim-line floating vanities with the faucet tucked into the side. They’re sizes range from 12 5/8” to 15 ¾” deep. They’re stylish with storage space below. Perhaps you’re considering a one level wet room for an ‘aging in place’ solution for Mom, whose mobility isn’t great (and won’t be getting great again). You’re going to voluntarily create a one level bathroom just in case she needs an accessible shower down the road. Or conversely, you’re ‘involuntarily’ living through a wet bathroom floor because your two teenage boys (who can’t remember to close the shower curtain) have water shooting onto the floor and soaking the nearby cabinet (Grant and Parker Foti, do you know what I’m talking about here???). You know this formula makes no sense (Teenage Boys + Bathrooms = An Orderly Bathroom with TLC). 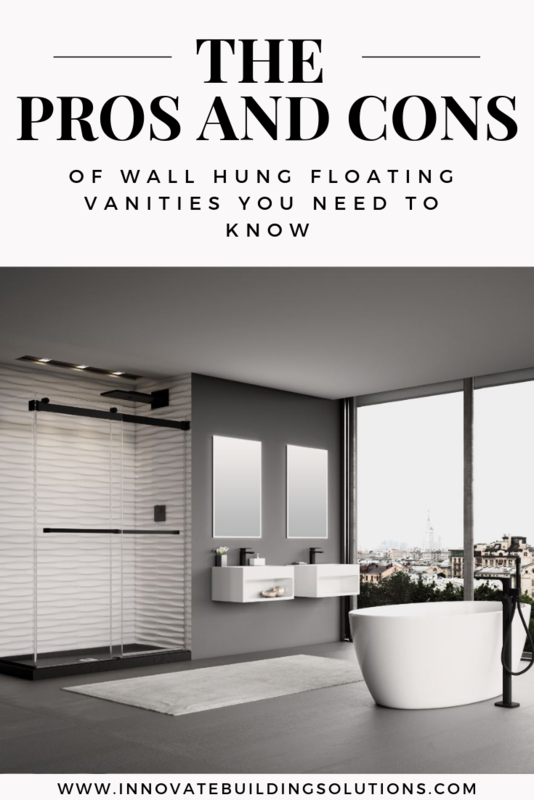 Since wall hung vanities are elevated above your bathroom floor, you’ll have less concern about your cabinet deteriorating from water on the ground (unless your home floods and then you have different problem). If you want to be as out of fashion as your 1970’s bell-bottoms, or your husbands’ powder-blue leisure suit from the 1960’s, then go out and buy an ornate floor-based vanity. Sure, they were the rage 20 years ago, but then again so were mullets. Bathroom designs styles today are contemporary (even in Modern Farmhouse bathrooms). They’re about clean lines. Euro and Shaker style cabinet fronts are in. Simple surfaces rule the day. 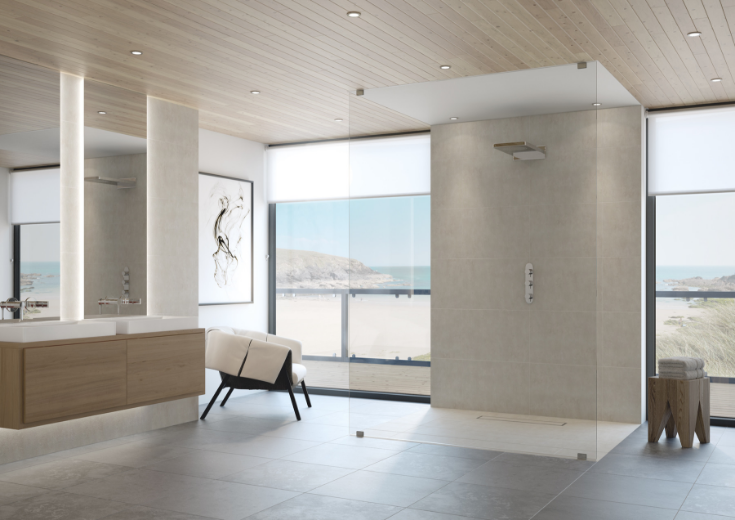 A Minimalist bathroom works to shift your mind away from your cluttered, crazy days. Wall hung vanities are to clean and contemporary bathrooms as peanut butter is to jelly (unless you’re allergic to peanut butter, but that’s a small technicality there – ha! Ha!). While pedestal sinks and wall hung sinks are the ultimate in space-efficiency (and work well in powder rooms), in a bathroom you (or your kids) use daily they don’t cut it. You need drawers. You need place to store razors, toothpaste, T.P, brushes and towels. Wall hung vanities offer efficient storage while not cramming your bathroom. For example, the curved wall hung vanity below only extends from the wall 16 7/8”, yet still has two drawers (and one even snakes around your plumbing)! How’s that for cool? (Advantage #6) Wall hung vanities make your floors simpler to clean and eliminate those ‘nooks and crannies’ which aren’t as tasty as those in Mrs. Thomas’ English Muffins! Think how your stomach feels when you’re cleaning the nooks and crannies around the base of your toilet or floor-based vanity? If it’s turning and churning, I can feel your pain. Mount your vanity. Mount your toilet. Not only will the ‘nooks and crannies’ around these units go ‘bye-bye’ (as our orange-haired President would say), but you can throw out a few toxic cleaning chemicals in the process. Who wants bathroom remodeling to be one iota (whatever is an iota anyway?) harder (or more expensive) than it has to be? That would be no one. 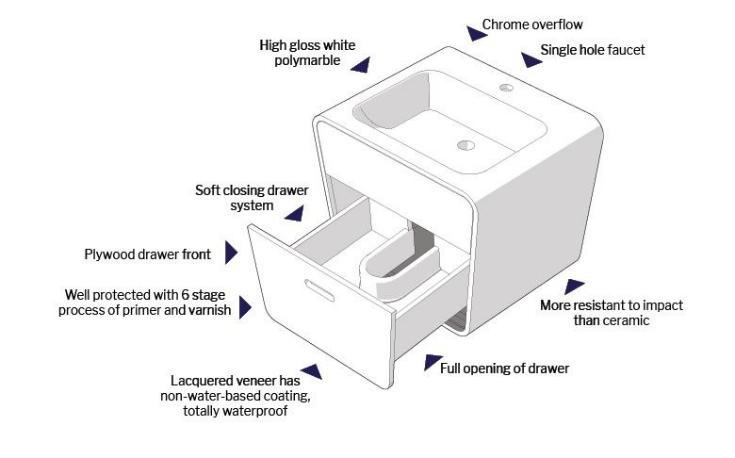 With this being said, if you decide to use a wall hung vanity you need to know it’s not the simplest cabinet to install. Since it needs to be braced behind the wall there’s more work and cost to get it done. However, if you’re working in new construction (where the walls are already opened), it’s not overly time consuming to put up a wall hung cabinet since there is no drywall to cut out and patch. One of the advantages of floor-based cabinets is they have taller cabinet boxes than their wall-hung counterparts, so you’ll have more space to cram your stuff in. However, one caveat to keep in mind. Even with floor-based cabinets you still can’t use all the space because you lose 2-4” at the bottom for the toe kick. While floating cabinets are right at home in modern bathrooms, they look like a fish out of water in traditional settings. It’s best to go with floor-based units if traditional styling is your thing. I’ll tell you a secret. You have to promise NOT to tell my wife Rose. 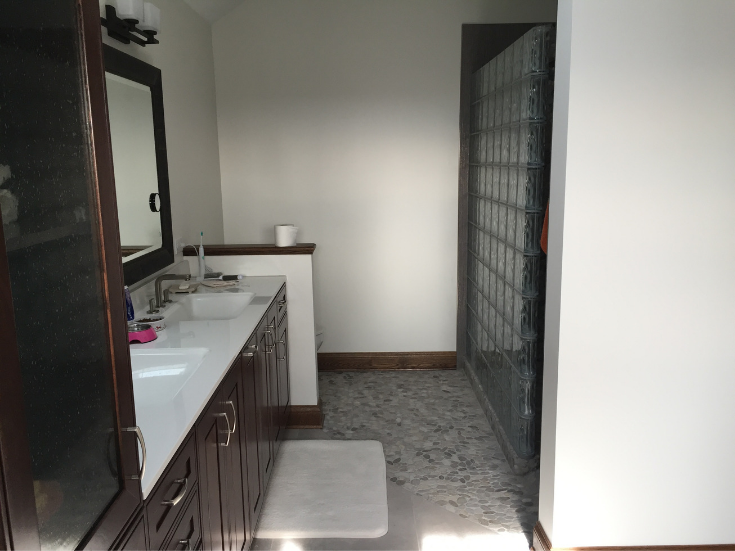 To save time changing those doggone pesky tiny vanity bulbs in our 2nd floor master bathroom, instead of going to our garage and getting a ladder (the safe option), I climb on our floor-based vanity countertop and cabinet. It’s not the safest option. It’s my way of getting this little task done quick. Conversely, if any of your kids are ‘climbers,’ they may get the urge to jump on top of the wall hung vanity for no good reason at all (as kids I bet you can remember doing all sorts of things your parents would have said was for no good reason at all). If you have adult or kid who is a climber, I’d recommend staying away from the wall hung cabinets. While they’re mounted to brackets in the wall, it’s still better to rely on the steadiness of a cabinet sitting on the floor, then one attached to a wall (IMHO). As you can see from the pros and cons of wall hung floating units, your cabinet choice isn’t a one-size-fits-all proposition. You need to factor in the style you like, the need for storage, the width of your bathroom and even if you’ve got ‘climbers’ in the family. If you need help with options in bathroom vanities, custom shower pans, grout-free shower panels, or even glass enclosure systems (for a project anywhere in the United States) call us at the number below. If you’re desperately searching for a qualified (and even dare-I-say an organized) bathroom remodeling contractor call the numbers below for help in Northeast and Central Ohio. For Nationwide supply of wall hung vanities, shower wall panels, shower enclosures and shower bases call Innovate Building Solutions at 877-668-5888. 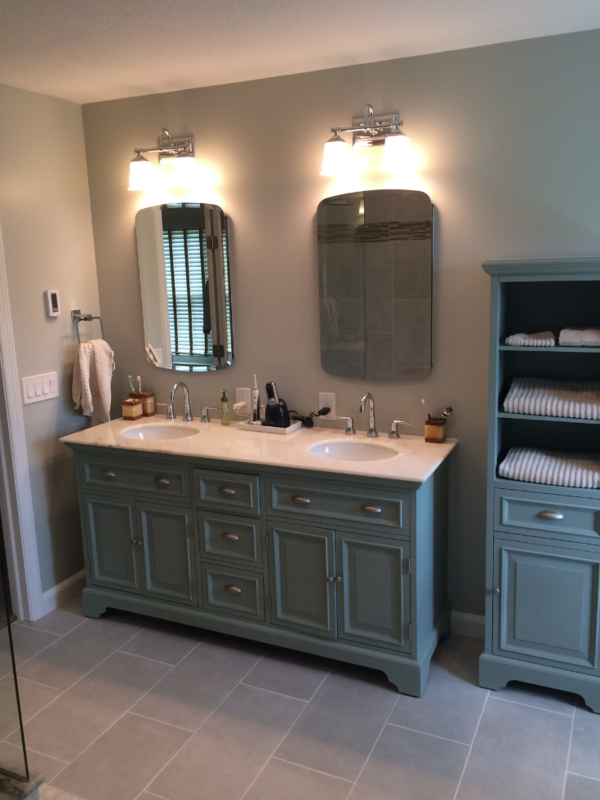 For a remodeling project in Cleveland contact Cleveland Design and Remodeling at 216-658-1270 or The Bath Doctor at 614-252-7294 in Columbus Ohio.